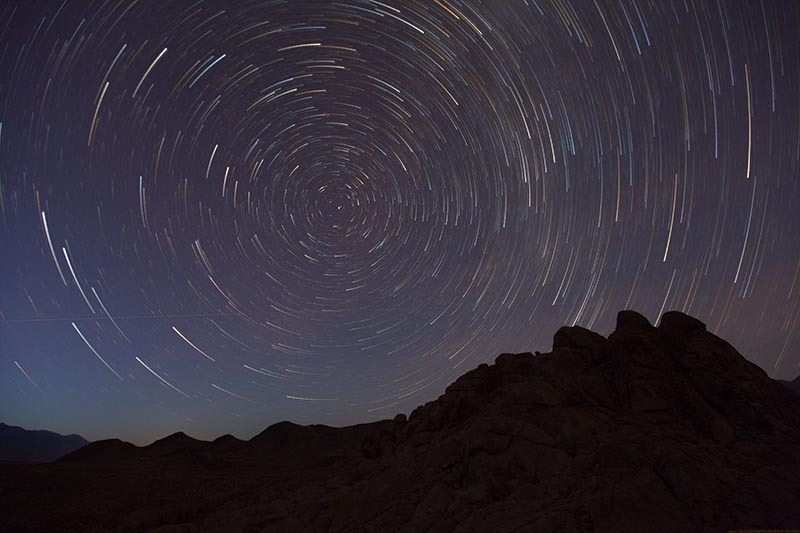 Star Trails tapered in TWO directions… read on for how. First we confess… Doing things backward applies to all manner of operations, not just Advanced Stacker PLUS so this technique is useful for almost any kind of batch processing. We’re pretty sure you are looking for a more practical solution, though! And here we offer a strategy that takes full advantage of Photoshop’s relentless bent on processing photos in alphabetical order. To make everything run “backward” we need to reverse the alphabetical order of the photos. Unfortunately, there is no number these files backward feature. We wish! There are some standalone programs for doing sophisticated file renaming but here we will use a tool you already have: Adobe Bridge. 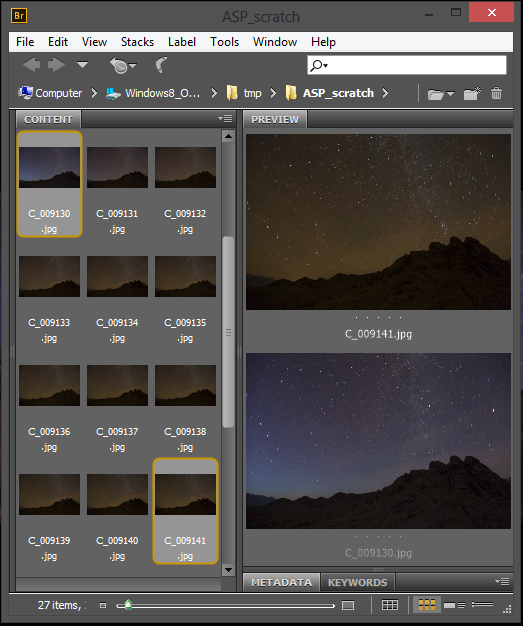 Adobe Lightroom can be used too – if you are anxious to know how, leave a comment and we will elaborate. Here is a quick comparison. The first shot is “reversed” causing the stars in the Northern Hemisphere to be rotating clockwise instead of the counter-clockwise direction that they ACTUALLY move in. While exactly the same shots were used in each case, the photos reveal one reason why you might want to reverse the order – to get a sky flavored with a bit of twilight blue. We have a lengthy article on how to use Adobe Bridge to feed the Advanced Stacker PLUS, so let’s start with using Bridge. Below is what our directory of files looks like. We compacted our Bridge display to make it easy to get a reasonable size screen capture. We slid the leftmost divider (normally it shows filters and folders) to the left. 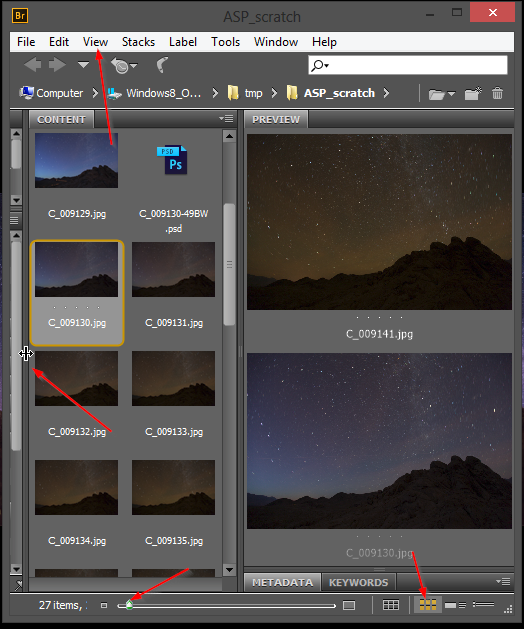 Notice the “content” pane contains thumbnails and the Preview pane shows the two files we selected – one obviously taken earlier when there was yet some blue twilight, and the other taken later. Arrows below indicate places where we can control the view that Bridge shows us. Some key controls for manipulating the Bridge display are shown. NOTE: You do not have to change the view, you can use the Sort option and uncheck the “Ascending” order. We find that the easiest way to reverse the displayed order is to change to List view. And then click on the header to reverse the sort order. While we can change the sort order directly (see sidebar) we prefer the neater view we get in List mode. Clicking the triangle on the Name column at the top of our content pane reverses the sort order and results in the display as shown at the right. Unfortunately Photoshop will not be swayed by the different sort order… it insists on processing files in ALPHABETICAL order. Our solution is to change the names of our files to reflect the desired ordering. 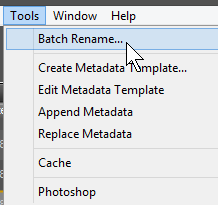 Batch rename (under Tools) gives us the ability to copy or move files while renaming them. Fortunately when we use the rename tool, it DOES respect our sort order. Our strategy is to use our reversed-order file list and place an increasing sequence number at the beginning of each file name. By prepending to the file name we can force the first file in our sorted list to become first alphabetically. Bridge has a built in “Sequence Number” which automatically increments. We do this often enough that we took the extra step to save the configuration as a preset. Adding a 3-digit prefix followed by a dash character. To add or remove items from the rename click the + or – icons. We must prefix a sequence number. 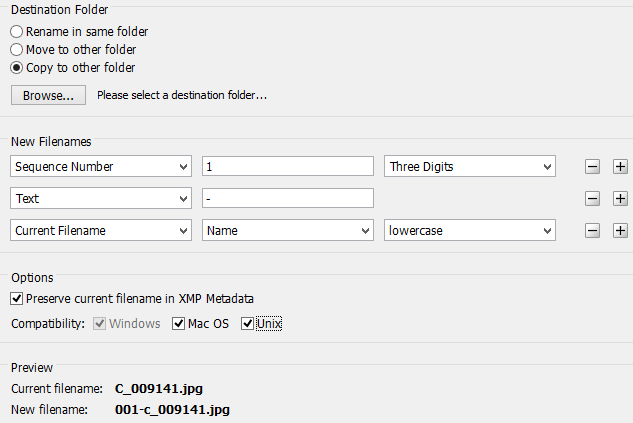 We strongly suggest “Preserving the current file name in the XMP data” so we can return the files to the original name if we wish. Or instead of renaming them, select “copy” and place the result in a separate folder. Once we have our renumbered files, we can feed them to Photoshop just as we described in the Stacking with Bridge article. And, if use the “preserve file name in XMP” option, we can easily rename the files back to their original names using the batch rename. The small trick for this is described at the end of the video below. 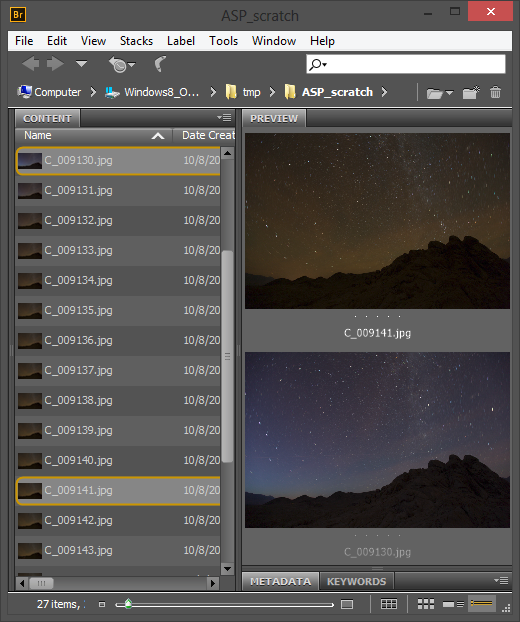 Using Lightroom has many drawbacks as we previously described. Lightroom also has a rename function (F2), it is, however a bit more tedious to set up. The other important thing to remember about using Lightroom for stacking is that Lightroom insists on exporting files before you are able to stack them. And because of these two complexities, we decided to stop writing here. If you really want to know how to use Lightroom to accomplish the same task, plead with us in the comments below. Or better yet, offer us bribes! 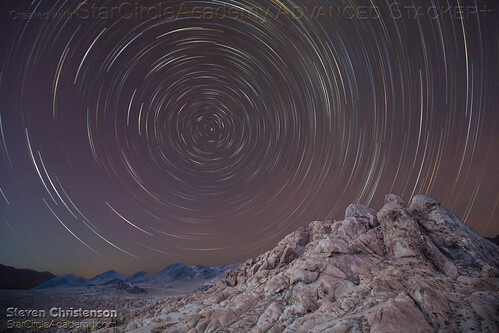 This entry was posted in Adobe Bridge, Advanced Stacker, Creativity, Photo Processing, Photoshop, Star Trails and tagged Advanced Stacker PLUS, ASP, backward, reverse on February 28, 2014 by Steven Christenson.